Unfortunately, in December of 2016, a key part of the drill stopped working when a faulty motor prevented the bit from extending and retracting between its two stabilizers. After managing to get the bit to extend after months of work, the Curiosity team has developed a new method for drilling that does not require stabilizers. The new method was recently tested and has been proven to be effective. The new method involves freehand drilling, where the drill bit remains extended and the entire arm is used to push the drill forward. While this is happening, the rover’s force sensor – which was originally included to stop the rover’s arm if it received a high-force jolt – is used to takes measurements. This prevents the drill bit from drifting sideways and getting stuck in rock, as well as providing the rover with a sense of touch. The test drill took place at a site called Lake Orcadie, which is located in the upper Vera Rubin Ridge – where Curiosity is currently located. The resulting hole, which was about 1 cm (half an inch) deep was not enough to produce a scientific sample, but indicated that the new method worked. Compared to the previous method, which was like a drill press, the new method is far more freehand. Of course, there are some drawbacks to this new method. For one, leaving the drill in its extended position means that it no longer has access to the device that sieves and portions rock powder before delivering it to the rover’s Collection and Handling for In-Situ Martian Rock Analysis (CHIMRA) instrumet. To address this, the engineers at JPL had to invent a new way to deposit the powder without this device. Here too, the engineers at JPL tested the method here on Earth. It consists of the drill shaking out the grains from its bit in order to deposit the sand directly in the CHIMRA instrument. While the tests have been successful here on Earth, it remains to be seen if this will work on Mars. Given that both atmospheric conditions and gravity are very different on the Red Planet, it remains to be seen if this will work there. This drill test was the first of many that are planned. And while this first test didn’t produce a full sample, Curiosity’s science team is confident that this is a positive step towards the resumption of regular drilling. If the method proves effective, the team hopes to collect multiple samples from Vera Rubin Ridge, especially from the upper side. This area contains both gray and red rocks, the latter of which are rich in minerals that form in the presence of water. Samples drilled from these rocks are expected to shed light on the origin of the ridge and its interaction with water. In the days ahead, Curiosity’s engineers will evaluate the results and likely attempt another drill test nearby. If enough sample is collected, they will use the rover’s Mastcam to attempt to portion the sample out and determine how much powder can be shaken from the drill bit. Fancy a little Mars in your daily life? You need go no further than the excellent raw image archive that NASA generously provides on its website, showing the view from the Opportunity and Curiosity rovers as they make their way on the surface. Opportunity is rolling along in its eleventh year of operations, busily exploring the west rim of Endeavour Crater. Below the jump is a stunning stitch-together of some of its latest images from space tweep Stu Atkinson, who runs a lovely blog called Road to Endeavour about the rover’s adventures. NASA also has an official blog that was last updated July 1. The Curiosity rover is in Gale Crater near the Martian equator, heading towards Mount Sharp as NASA picks paths that are the softest for its damaged wheels. Panorama maker Andrew Bodrov recently put together a new 360-degree view of Curiosity’s mastcam, which encompasses 137 images taken on Sol 673. You can see that below the jump as well. Below are a couple of more raw views from the Curiosity rover taken on Sol 685. And across Mars, some views from Opportunity on Sol 3721 of the mission. The rover is facing the elimination of its funding in 2015, although in budget discussions from February NASA said it does have a route for it to get money (if Congress approves). A view from NASA’s Opportunity rover on Sol 3721 as it explores Endeavour Crater. Credit: NASA/JPL-Caltech/Cornell Univ./Arizona State Univ. Here’s a nice distraction to start off the day: pretend you’re playing in the sandbox of Mars alongside Curiosity. This new panorama shows the NASA Rover hanging out somewhat nearby Mount Sharp (Aeolis Mons), its ultimate destination for the two-year prime mission it’s currently on. Bodrov, who is from Estonia, frequently does space-related panoramas. We wrote about a couple of other Curiosity panoramas he did in March 2013, in February 2013 and August 2012. Last year, he told Universe Today that he has used PTGui panoramic stitching software from New House Internet Services BV to accomplish the stunning views. He also has a wealth of images from the Baikonur Cosmodrome, which is the launch site for Soyuz spacecraft missions. “It’s very nice to see the achievements of humanity which allows you to see a picture of another world,” Bodrov said in 2012. Take a deep breath because this new panorama from Mars enthusiast Stu Atkinson will take it away. Zoom in and you can see actual rocks. Click that little button at the right of the toolbar and Mars will take over your screen. So far, Curiosity has rolled across a barely dusty plain in Gale Crater. Here’s a look of things to come. In black-and-white image from Curiosity, there appear to be big dunes to cross to get to the foothills of Aeolis Mons, or Mount Sharp. Curiosity has nearly finished robotic arm tests. Once complete, the rover will be able to touch and examine its first Mars rock. “We’re about to drive some more and try to find the right rock to begin doing contact science with the arm,” said Jennifer Trosper, Curiosity mission manager at NASA’s Jet Propulsion Laboratory in Pasadena, Calif, in a press release. This image from NASA’s Curiosity rover shows the open inlet where powered rock and soil samples will be funneled down for analysis. It was taken by the Mars Hand Lens Imager (MAHLI) on Curiosity’s 36th Martian day, or sol, of operations on Mars (Sept. 11, 2012). MAHLI was about 8 inches (20 centimeters) away from the mouth of the Chemistry and Mineralogy (CheMin) instrument when it took the picture. The entrance of the funnel is about 1.4 inches (3.5 centimeters) in diameter. The mesh screen is about 2.3 inches (5.9 centimeters) deep. The mesh size is 0.04 inches (1 millimeter). Once the samples have gone down the funnel, CheMin will be shooting X-rays at the samples to identify and quantify the minerals. Engineers and scientists use images like these to check out Curiosity’s instruments. This image is a composite of eight MAHLI pictures acquired at different focus positions and merged onboard the instrument before transmission to Earth; this is the first time the MAHLI performed this technique since arriving at Curiosity’s field site inside Gale Crater. The image also shows angular and rounded pebbles and sand that were deposited on the rover deck during landing on Aug. 5, 2012 PDT (Aug. 6, 2012 EDT). Two science instruments, a camera called Mars Hand Lens Imager, or MAHLI, that can take close-up color images and a tool called Alpha Particle X-ray Spectrometer (APXS) that can determine the elemental composition of a rock, also have passed tests. The instruments are mounted on a turret at the end of the robotic arm and can be placed in contact with target rocks. The adjustable focus MAHLI camera produced images this week of objects near and far; of the underbelly of Curiosity, across inlet ports and a penny that serves as a calibration target on the rover. This close-up image shows tiny grains of Martian sand that settled on the penny that serves as a calibration target on NASA’s Curiosity rover. The larger grain under Abraham Lincoln’s ear is about 0.2 millimeters across. The grains are classified as fine to very fine sand. The Mars Hand Lens Imagery (MAHLI) on the Curiosity rover taken by the Mast Camera on the 32nd Martian day, or sol, of operations on the surface. Engineers imaged MAHLI to inspect the dust cover and to ensure that the tool’s LED lights are functional. Scientists enhanced the image to show the scene as it would appear under Earth’s lighting conditions. This helps in analyzing the background terrain. Check out more images from the Mars Science Laboratory teleconference. Images from the Curiosity rover on Mars are truly spectacular but a large mosaic from the THEMIS camera aboard NASA’s Mars Odyssey orbiter gives a grand perspective of our new foothold on Mars. Take some time to rove and explore Gale Crater. The viewer, created using a web-imaging technology from Zoomify, is set to move between points of interest, such as Mars Science Laboratory’s landing site in Aeolis Palus, Glenelg, and Aeolis Mons/Mount Sharp itself. The layered sediments flanking Mount Sharp make it the primary target for Curiosity’s two-year mission. Take control at anytime by clicking on the image. This will stop the automatic roving and leave you in control to explore the terrain of Gale Crater. Use your mouse or the toolbar controls to pan and zoom around the image. You can also use the dropdown in the upper right to take you directly to certain points of interest in the image. Over time, we will add to this interactive feature as more geological points of interest are identified. THEMIS stands for Thermal Emission Imaging System which is a multiband visible and infrared camera aboard Odyssey. The comprehensive mosaic is pieced together from 205 individual scenes, most taken recently but some dating to 2002 shortly after Odyssey entered Mars orbit in 2001. These images were taken before MSL landed on Mars. Even so, as large as the SUV-sized rover is, it would be too small to see in these images. The smallest details in this image are 18 meters or 60 feet across. Gale Crater is 154 kilometers (96 miles) wide. Near the center rises Aeolis Mons, a 5 km (3 mile) high mound of layered sediments, informally dubbed Mount Sharp, after planetary geologist Robert Sharp who died in 2004. Scientists for a time referred to the conical mountain as “The Mound.” The mountain, which would stand among the highest on Earth, cannot be seen from Earth and was unknown before planetary probes visited the Red Planet. Gale Crater zoom tour created by John Williams (TerraZoom) using Zoomify. About the author: John Williams is owner of TerraZoom, a Colorado-based web development shop specializing in web mapping and online image zooms. He also writes the award-winning blog, StarryCritters, an interactive site devoted to looking at images from NASA’s Great Observatories and other sources in a different way. A former contributing editor for Final Frontier, his work has appeared in the Planetary Society Blog, Air & Space Smithsonian, Astronomy, Earth, MX Developer’s Journal, The Kansas City Star and many other newspapers and magazines. The movie “The Dish” tells the wonderful story of how Australian radio communication dishes saved the day as Apollo 11 landed on the Moon, allowing the world to watch in wonder. While the movie isn’t entirely accurate, Australia does have a marvelous history of providing tracking and communication with spacecraft on historic missions. The tradition continues with the upcoming landing of the Mars Science Laboratory Curiosity rover when it sets down on Mars on August 5/6 after a nail-biting entry, descent and landing. The Canberra Deep Space Communication Complex (CDSCC) will be the main tracking station for the landing activities. Its 70-m and two 34-m antennas will receive signals from the spacecraft both directly and then relayed through another NASA spacecraft, Mars Odyssey, in orbit around the Red Planet. The 64-m Parkes telescope – the one featured in “The Dish” — will record signals directly from the spacecraft as a backup in case there is a problem with the relaying. But as the spacecraft descends, it will drop below the Martian horizon (and out of direct sight of Earth-based antennas) about two minutes before touchdown, and Parkes will cease receiving its signals. A third, smaller, antenna managed by the European Space Agency (ESA) at New Norcia near Perth in WA will provide extra redundancy. It will receive signals from the spacecraft recorded and re-sent through ESA’s Mars Express satellite, which is in orbit around Mars. Signals from the Canberra station will be sent directly to mission scientists at NASA’s Jet Propulsion Laboratory (JPL) in Pasadena, California. Data from Parkes and New Norcia will be sent later for analysis. While the landing is not controlled from Earth, as the lag-time in radio signals (13.8 minutes one way) makes any input from Earth impossible, tracking the spacecraft as it approaches Mars is very important. “We are looking forward to receiving and sending that touchdown signal from MSL, so we can help end those ‘7 minutes of terror’ for the amazing scientists and engineers waiting at JPL,” said Glen Nagle, Education and Public Outreach Officer at Canberra Deep Space Communication Complex, via email. Nagle took this panoramic image, above, early in December 2011 in Canberra while the dishes were getting their first data from MSL after its launch, so the facility has been an integral part of guiding the spacecraft during its entire journey to Mars. The last opportunity to send the spacecraft any commands will be two hours before it enters the atmosphere. “After that, it’s on its own,” said Nagle. NASA engineers also want to know exactly where the spacecraft enters the atmosphere so they can locate the rover when it lands, and of course, the hopeful rover fans back on Earth will want to find out as soon as possible to know if the landing succeeded or not. The spacecraft will slam into the atmosphere at 20,000 km per hour. Over the next seven minutes the craft and then its payload must be slowed to essentially zero. 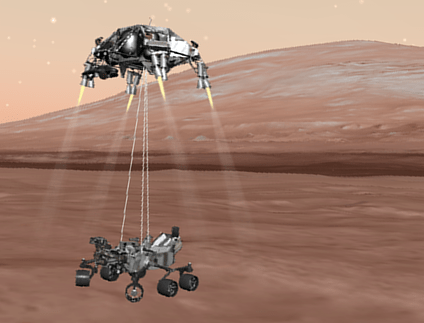 The landing has several stages: cruise, deployment of the entry capsule and then the parachute, separation of the heat shield, and finally the operation of the “skycrane” that will lower the 900-kg rover, Curiosity, onto the Martian surface. As each stage is successfully completed the spacecraft will send a unique tone indicating that it has occurred. During the landing, the mission scientists can only watch and wait. They call this time the “seven minutes of terror”. The exact landing time for the spacecraft is determined by several factors, including descent time on the parachute, Martian winds, and any variation how the spacecraft flies under power before the landing. Confirmation of a touchdown signal could be received on Earth at 05:31 UTC on Aug. 6 (10:31 p.m. PDT on Aug. 5 and 1:31 a.m. EDT Aug. 6, 3.31 pm AEST Aug. 6) plus or minus a minute. Winds could mean that descent time on the parachute is longer, but at this time of year on Mars the weather is very stable and is not expected to cause any problems. If the final set of tones is not heard, Mars Odyssey will listen for them again when it orbits over the landing site 1.5 hours later. And so are all the rover fans back on Earth! And here’s another previous article about how we *really* watched the footage from the Apollo 11 Moon landing, thanks to the Australian radio dishes. To find out, he took advantage of NASA’s Eyes on the Solar System website. This amazing tool creates realistic simulated views based on real data, and allows you to travel to any planet, moon or spacecraft across time and space, in 3D and in real time. It is absolutely awesome and very fun to play with! Bill created the video above by using Eyes on the Solar System, which provides a great look at the view approaching Mars. Of course, no one will be there on Mars to see it happen, and we won’t know for at least 14 minutes after the fact if it happened successfully. So consider yourself lucky to have this sneak peak! See more screenshots and information at Riding With Robots, and check out Bill’s one-page “Cheat Sheet” which provides a quick guide to the mission and the landing, with links to all sorts of information.